Summer is here, time to jump in the pool or lay by the beach and enjoy the warmer weather! 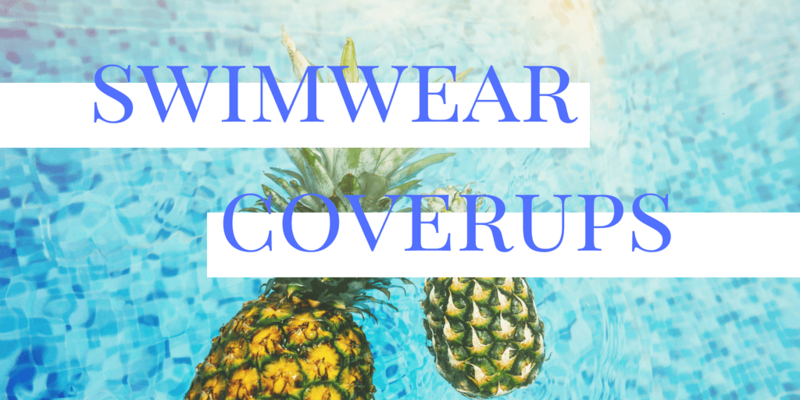 When you’re not splashing in the water or sunbathing safely, you probably want adorable swimwear coverups to make your way from water’s edge to public places. Save money and a trip to the department stores with these DIY cover up ideas! Let’s start with this adorable cover up from Jamie Sanders at Scattered Thoughts of a Crafty Mom. 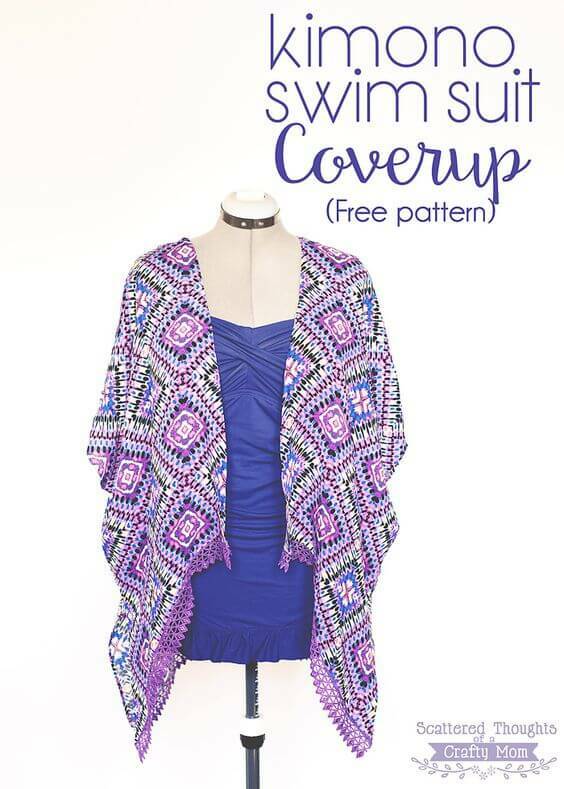 With a free pattern, this super easy coverup is perfect for the crafty sewer short on time and money. One size fits most and we love the cute trim she added. Find a fabric in a pattern that you love that matches your swimsuit and gather your supplies because you will want to make this right away! 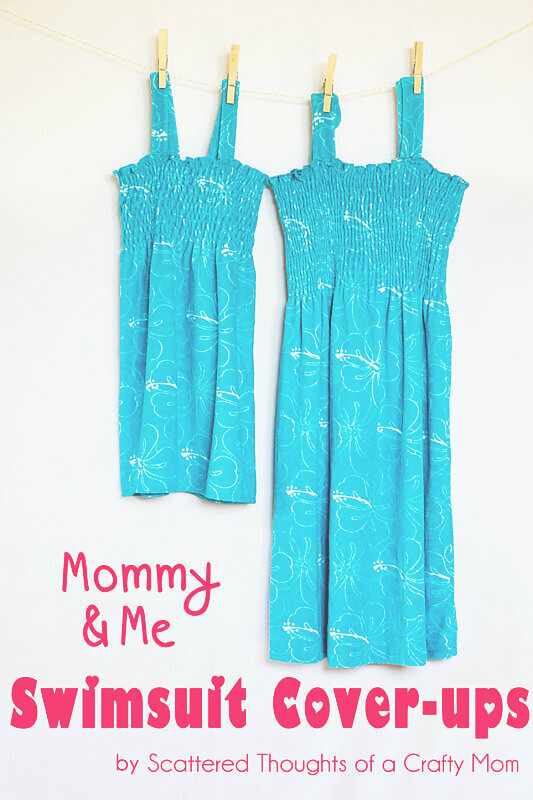 Check out these super cute matching mommy and me coverups! Jamie Sanders from Scattered Thoughts of a Crafty Mom does it again. The stretchy terrycloth fabric is perfect for pairing over a wet swimsuit. And the shirring top ads a tropical touch while providing practical support and shape for the coverup. With just a few steps, you can make these matching coverups and be the cutest and most fashionable mommy-daughter duo at the pool! Just one yard of fabric is all you need for this stylish coverup from Brit + Co. They recommend using lycra, spandex, or any fabric that doesn’t fray when you cut it. After cutting and sewing on shoulder straps, your coverup is beach ready! Adjust the length of the straps to adjust coverage. Or, as Brit + Co shows, use lace straps for a fun twist on your coverup. It’s hard to go wrong with such a chic and versatile piece! Transform a basic white t-shirt into this groovy tie-dye coverup with just a few simple steps! Seriously, after dyeing the shirt, all it takes to create this piece is a few cuts and sewing up loose ends. Save some steps and buy a tie-dyed shirt. Use this pattern to transform any t-shirt into a playful, fun, and easy going coverup for your summer water adventures. 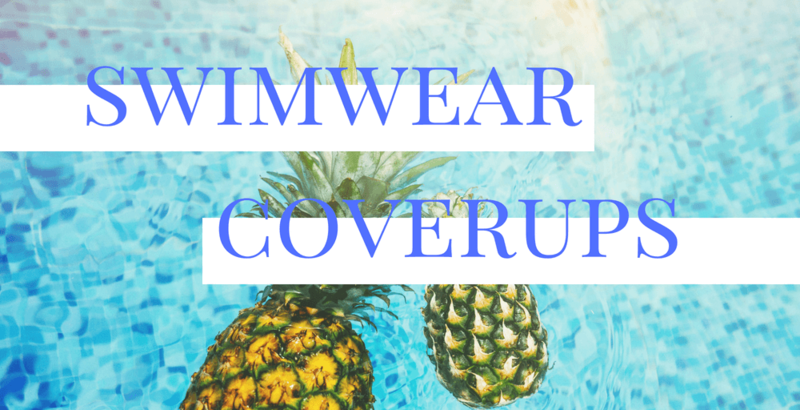 Want Next Level Swimwear Coverups? When you want to transform an ordinary cover to add your own unique style or fit to your personal body shape, All Alterations can help! When it comes to your summer wardrobe, we are the experts to keep you looking your best!